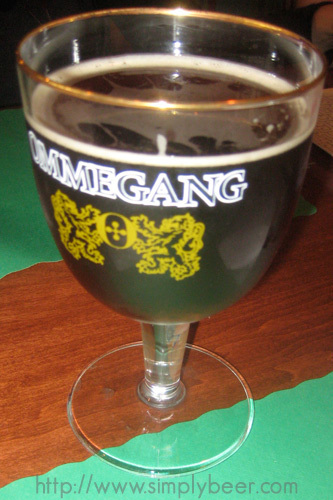 The Ommegang Rouge is a Flanders red ale. If you have never had a Flanders red ale, find out a bit about the style first because this has a habit of shocking people who don’t know what to expect. Based on the recommendation of the Owner at the Cloverleaf Tavern, I had to give this beer a try while they had it on tap. This beer was a deep reddish brown, bit hazy with a tiny little ring of foam. The aroma was dominated by sour cherries and green apple. Initially the taste was sour cherries, followed by a bit of sweetness that transitioned back to bitter/green apple. The mouth feel was almost like cider, it had a good zing. This beer was quite complex and enjoyable. I would not set out to drink more then one or two of these at a time, but at 5.5$% abv, it isn’t going to knock you over. I think my palette would be destroyed after a couple of these and I wouldn’t be able to enjoy any other beer. We have this on tap right now at The Belgian Cafe in Philadelphia and it sells quite well. I often recommend it to folks who are new to sour or Belgian styles. Ever since Rodenbach got so much sweeter I have been off the Flemish reds, but this beer is a friendly reminder how good they can be.